Without mercy of Lalita Devi, we cannot think about Krishna. Sri Lalita Devi is born in Uchagaon, near Varsana, and every day she meets with Srimati Radhika. Lalita always controls Radharani: she manages Her meeting with Krishna, Her separation from Him—everything. Lalita Devi controls everything, that is why she is a Guru: Prema-Guru. Lalita always trains and gives instruction to Srimati Radhika—how She should walk, how She should talk, and so on—and Radhika always follows her. Lalita teaches Her in the mood of vatsalya-rasa. "When Lalita Devi finds a drop of perspiration at the feet of Sri Sri Radha-Govinda, she furiously engages herself to remove it. 'How has it come there? We are circumambulating Them to see that not the least pain can enter this domain to trouble Them, but how, without our notice, has this perspiration appeared? Perspiration, perspiration!' So she is furiously chastising herself and wants to immediately take birth one lakh (100,000) times—with that force she comes to remove that drop of perspiration from the lotus feet of either of the Divine Couple." Srila Rupa Goswami wrote Sri Lalitastakam; it is a very nice poem. There Rupa Goswami explained the glory of Lalita Devi, and he himself is Rupa Manjari, a friend of Lalita. So, today is the appearance day of Lalita Devi. If we do not remember Lalita, how is it possible to get Krishna? Lalita also arranges viraha, separation. Radhika has no wish to keep so much distance from Krishna, but by the mercy of Lalita, Radharani does that, and Krishna does that too. When separation comes, it intensifies and increases what Radhika and Krishna feel. Lalita Devi arranges that, so she is the Guru of Prema. 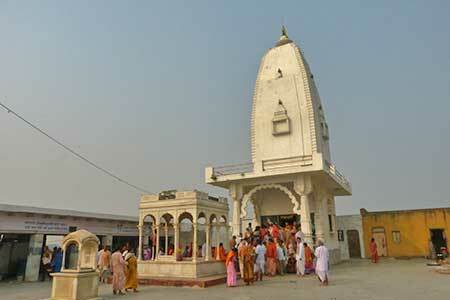 Srila Guru Maharaj said that of all places his favourite place was Uchagaon. When Srila Guru Maharaj asked Gurudev, "What is your favourite place in Vrindavan?" He said, "Uchagaon." So, it is also Srila Gurudev's favourite place. Every year, when we go to Vrindavan (before we go to Varshana, the house of Radharani), we go and sit there for some time. Without Gurudev's mercy we cannot think about this all. "Without lotus feet of Radha, you can never meet Krishna. All Vedas say that Krishna is the property of Radha's maidservants." at the temple marking the birthplace of Sri Lalita Devi.